Granola satisfies that sweet, salty, crunchy craving we all have. Well, that’s precisely what it should do! 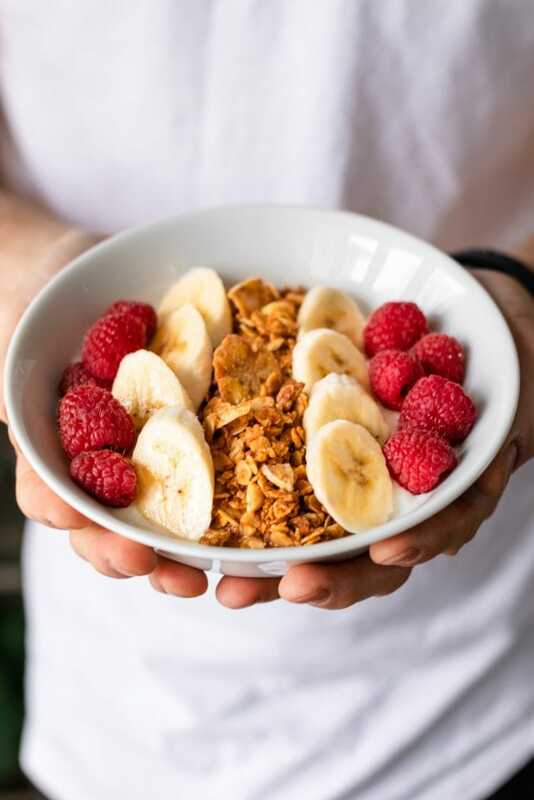 Granola was invented at a sanitarium (a health-like spa of its day) in the 1860s and marketed as a health food. I cannot imagine what the first granola tasted like, but it has been reincarnated and reinvented almost every decade since. Nowadays you can find pretty much anything and everything calling itself granola. The health food part is often overlooked and the list of ingredients is too long. 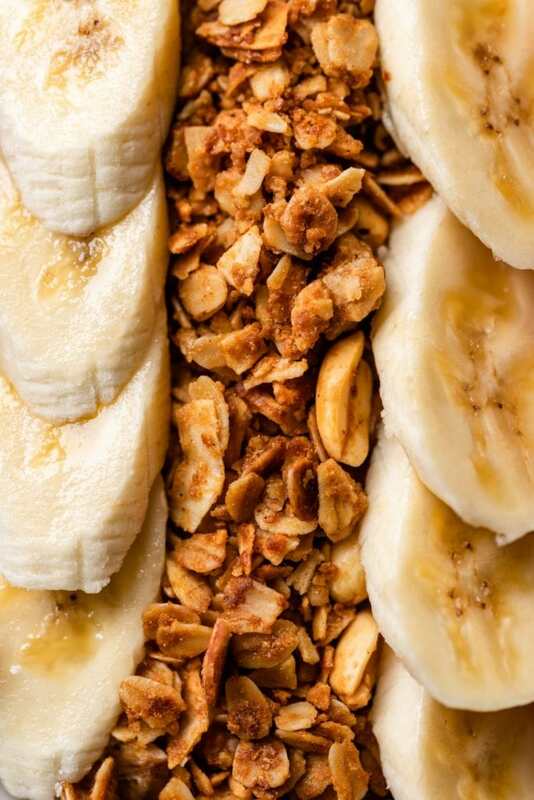 This peanut butter granola recipe brings the flavor back while keeping the ingredients simple. 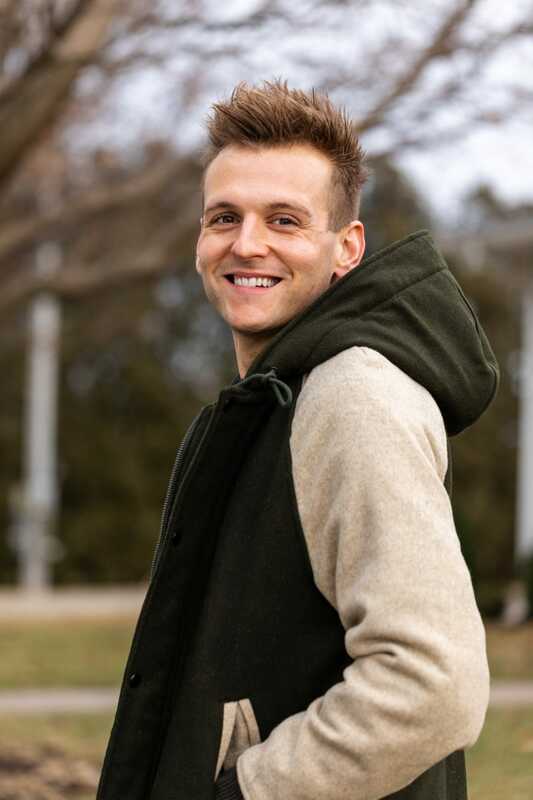 they’re less processed – yay! Flaked coconut is also extremely important. The more I bake, the more I realize that there’s no need for that sweetened, almost gluey, shredded coconut I was used to growing up. Sorry, Mom! Nowadays, you can easily find raw, flaked coconut in pretty much any grocery store. No additives, no sugar, only thick pieces of delicious coconut. 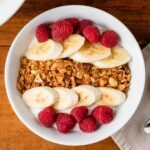 Peanuts aren’t usually a granola staple, but in this recipe, they add a salty crunch I absolutely love (you will too!). Pecans are a must because they’re just everyone’s favorite. I like a mixture of differently sized nut pieces in my granola. Chop some finely and leave others in larger pieces. This combination of sizes adds variety and lends to good texture with every bite. The second thing any granola needs is something that will bind it all together. And for that, it’s crucial to create a “glaze,” or at least something with a viscous texture. Honey and peanut butter provide the needed liquidity while sweetening and flavoring the granola. In my book, granola doesn’t need to be overly sweet, but I do like it to add these two ingredients as a little sweetness that balances out the salt. The peanut butter provides the perfect way for the peanuts to shine. Just a fun little tie-in for you there! In my granola, I use a local raw honey because that’s the variety I prefer. You can also use all-natural peanut butter. The texture will be slightly different but still delicious. Wet ingredients are the prototypical binding agent you’ll find in most granola recipes. But I also add dry milk powder and wheat germ in this recipe. They’re totally optional (try them first, though), but both create texture and weave pieces of the granola together. As an added bonus, the wheat germ adds a surprisingly welcome toasted wheat flavor. The finishing touch – maybe even the pièce de résistance – is the banana chips stirred in at the end. I love banana chips (like really, really love them), but have you ever looked at the label? They’re chocked full of copious amounts of oil and sugar. That’s surprising because bananas are naturally one of the highest sugar fruits. Thankfully, no oil and no sugar added banana chips are now on the market. Don’t ask me how they do it, but somehow Bare brand (affiliate link) banana chips are made from only bananas. Period. And they’re so darn good. It’s amazing. Banana chips create that perfect peanut butter and banana combination that I grew up loving and this time without the guilt. If you take my advice and use the banana chips (hooray! ), make sure to add them at the end because they’re already crispy and crunchy. You can add other additions at this point too: dried fruits, chocolate bits, or anything else your tastebuds desire. 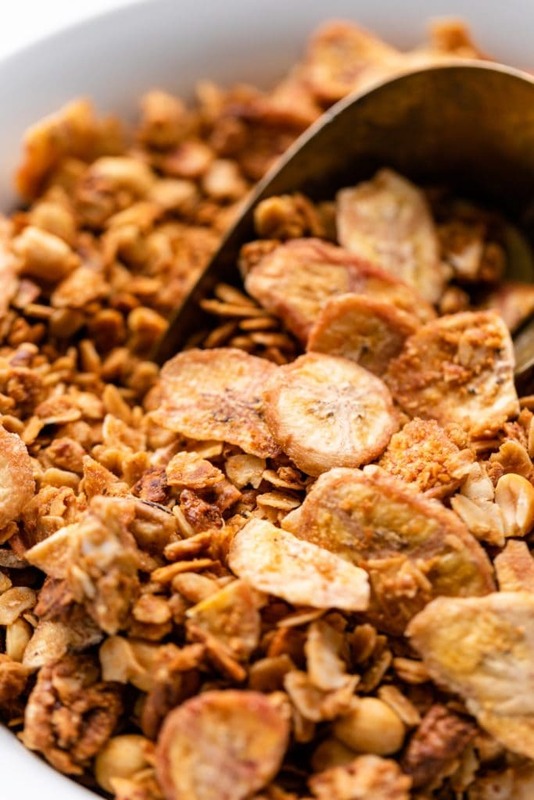 Yeah, the banana chips just look so at home in this granola! 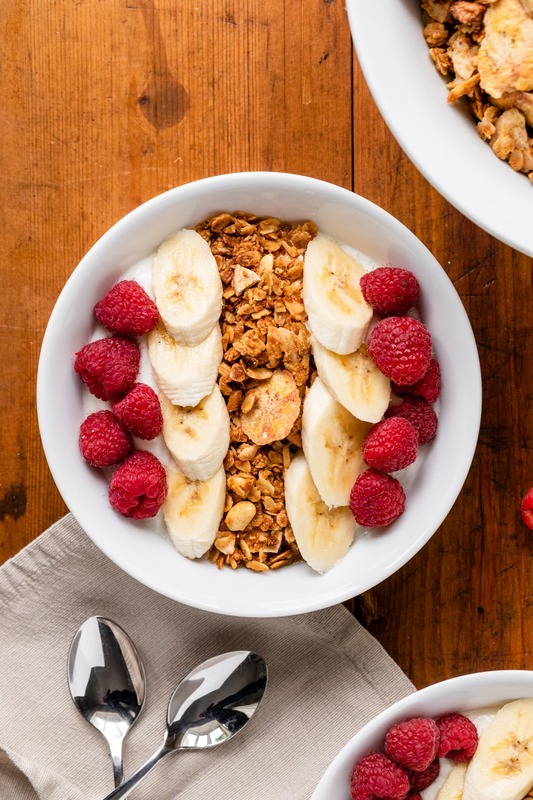 This granola is going to be your new staple recipe! 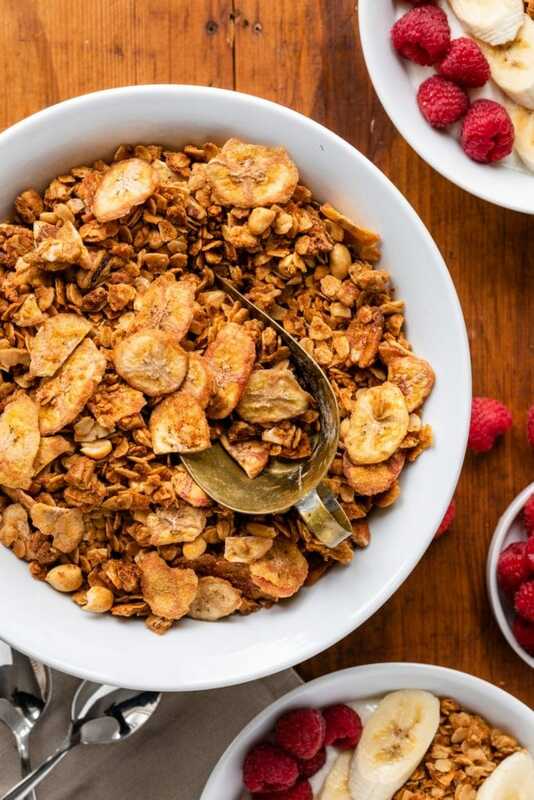 Let me know if the comments what type of granola you make or what you’d add in instead of banana chips! Granola from the store? Overrated! This homemade peanut butter granola that’s made from scratch? Totally awesome! In a large bowl, combine the old fashioned oats, flaked coconut, wheat germ, pecans, peanuts, and powdered milk. Toss to combine and set aside. In a microwave-safe glass container, combine the honey, grapeseed oil, peanut butter, and cinnamon. Heat in one-minute increments, stirring in-between until the mixture begins to boil. This takes approximately 4-5 minutes of heating. When the mixture has boiled, stir and pour over the prepared dry ingredients. Stir until the dry ingredients are moistened and start to stick together. Pour onto one large or two small baking sheets and place in the oven on the center rack. Bake 45 minutes until evenly golden brown and toasted, stirring every 15 minutes. During the first stir, sprinkle with salt. Once baked, remove from oven and break up any large pieces of granola. Cool for 15 minutes then pour into a large bowl and add the banana chips. Toss to incorporate and store in an airtight container.